The suits at Comedy Central have aided and abetted terrorism by censoring an episode of South Park to remove all references to Mohammed. They followed in the courageous footsteps of the Yale University Press, which, before publishing a book about the Danish cartoon controversy last year, deleted the actual cartoons from the manuscript. 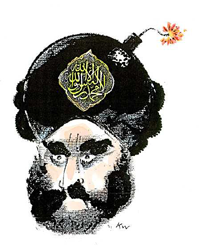 My drawing skills are nonexistent, but I figure the least I can do is republish the Mohammed turban-bomb drawing, above — the most iconic of the cartoons that touched off riots that killed more than 100 people in 2005. I’m sensitive to the argument that nobody’s religion should be mocked. But radical Muslims have made Islam a target by substituting violence for evangelism. Ridicule is a non-violent way of fighting back. This entry was posted in Uncategorized and tagged Ayaan Hirsi Ali, Islam, Muslim Heroes by Kirk Petersen. Bookmark the permalink.